While the public knows us as “KTOO” or, more informally, “K-2,” Capital Community Broadcasting, Inc. is the not-for-profit Juneau-based private corporation that provides a variety of telecommunications services to Juneau and statewide audiences. Founded by community volunteers in 1972, CCBI started service to Juneau on January 27, 1974, with a 10-watt radio station and heavy commitment to local service, community access and diverse viewpoints. Even before KTOO-FM signed on the air, community volunteers sent Juneau news stories by telephone to the three public radio stations in existence in Alaska. That tiny “network” eventually became the Alaska Public Radio Network. In 1977, we launched a television production unit to provide daily Legislative coverage, and 18 months later, KTOO-TV signed on the air as a fledgling PBS station on October 1, 1978. By 1983, the TV station was broadcasting on low-power translators through Southeast Alaska. Today, KTOO provides a variety of public services throughout Alaska. 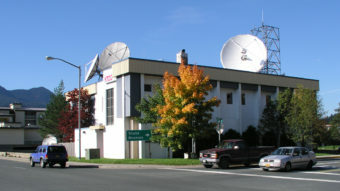 In addition to providing the Alaska Public Television program service to Southeast Alaska, KTOO-TV operates a full-time cable and satellite television channel, 360 North, which beams live C-Span style legislative coverage throughout the state (Gavel to Gavel Alaska). The channel expanded in 2007 to provide a wide variety of Alaska programming on a year-round basis. KTOO Productions assists a range of government, agency and non-profit clients with audio and video production and program distribution services. The web sites www.ktoo.org and www.360North.org deliver KTOO’s content to an expanding on-line audience throughout Alaska and the lower 48. KTOO also owns and operates three public radio stations. KTOO News offers a diverse range of news and music programs and is the most-listened to radio station in the Juneau radio market. KRNN provides a broad mix of music and arts programming, while KXLL offers music and public service targeted at a younger audience.